"Hansel & Gretel: Witch Hunters" aspires to be cheeky entertainment, sold with a wink and a fist to the face with plenty of ghouls, trolls, and horrible humans to populate a carnival atmosphere of genre delights. However, despite a colorful presentation, the movie fails to raise much hell, insisting on a flat tone of tedious storytelling when all anyone really wants to see are the titular heroes continuously slaughtering broom-riding she-devils, sprinting across this askew fantasyland on the hunt to save humanity. As children, siblings Hansel (Jeremy Renner) and Gretel (Gemma Arterton) were once trapped inside a house of candy, fattened and prepared for roasting by an evil witch. Surviving the ordeal, the pair developed a taste for witch hunting, spending their formative years building a reputation as steely warriors with intricate weapons, able to slay anything evil daring to step in their way. Brought to a grim village run by Sheriff Berringer (Peter Stormare), the duo is tasked with retrieving the community's stolen children, finding the wicked Muriel (Famke Janssen) and her demon assistants behind the disappearances. Off to save the day, Hansel is distracted by Mina (Pihla Viitala), a comely, lonely villager, while Gretel aligns herself with troll Edward (Derek Mears), two forces that come in handy when Muriel prepares for her final assault, calling on the mystery of a Blood Moon eclipse event to gift the local witch population ultimate power. The writer/director is Tommy Wirkola, who found some fringe appreciation as the helmer of 2009's "Dead Snow," just your average Norwegian ski-weekend splatterfest involving Nazi zombies. Trapping a charmingly bizarre concept in a dull, unfunny movie, Wirkola returned to his old habits with "Witch Hunters," only this time he found Hollywood backing (Will Ferrell co-produces the picture) and a considerable budget to feel out his Sam Raimi-stained impulses. Unfortunately, "Witch Hunters" isn't an "Army of Darkness" type of romp blessed with golden one-liners and brisk pacing. It's mostly leaden, reliant on cursing for shock value, while there's a plot here that's far more complicated than it needs to be, crippling the natural momentum of what should've been a frothy, furious creation. Then there's this whole thing with the Blood Moon that's hastily arranged to bring substance to a one-joke premise, finding Wirkola striving to give purpose to material best served weightless. The film only runs about 80 minutes, leaving little time to establish Hansel and Gretel as traumatized kids, arrange Muriel's quest to scrounge up children for sacrifice, deal with the siblings and their side relationships, work through quirky village personalities (Thomas Mann plays Ben, a die-hard fan of the witch-busting duo), and close out the picture with a free-for-all fight to the death. Wirkola's script is ambitious, but overwritten, losing the thrill of the visuals by laboring through unnecessary motivation. Muriel doesn't need to be a conductor of doomsday. She's perfectly wicked as a witch. "Witch Hunters" has a host of creative ideas, including making Hansel a diabetic in constant need of insulin shots after consuming part of the candy house as a child, and make-up achievements on the various witches are exceptional, offering actual textures on the faces of the enemy. There's also Edward, who's an enormous Henson-style puppet with delightful creature features, adding to the practical feel of the picture, which divides its time between CGI displays and special effects, sustaining inviting fantasy elements. Wirkola deserves credit for keeping "Witch Hunters" grounded in touchable nightmares. It's just a shame there isn't a more interesting film to help bring the craftsmanship to life. All of the performances are uneven, finding Renner visibly bored with his role, while Janssen is embarrassingly bad as Muriel, a witch who apparently has been struck by a Random English Accent curse during her extensive travels. Arterton is more amusing to watch, getting into the spirit of the movie by diving around the frame and taking some bloody entrails to the face. She's game, but Wirkola doesn't know what to do with her energy, finding difficulty keeping the proceedings open and reckless, with too much of the action disappointingly stagebound and stiffly choreographed, while any chaos involving the witches and their flying brooms is kept frustratingly minimal, avoiding any prolonged exposure to the picture's most promising element of mayhem. The feature isn't a particularly painful sit, but its many disappointments do take their toll, carrying to a severely underwhelming climax -- a real bummer considering its witch battle royal promise. Cruelly, there's no extended madcap genre buzz to gobble down here, leaving "Hansel & Gretel: Witch Hunters" kind of a drag, which is a strange reaction to have to such a promising R-rated tale of funky fairy tale embellishment. 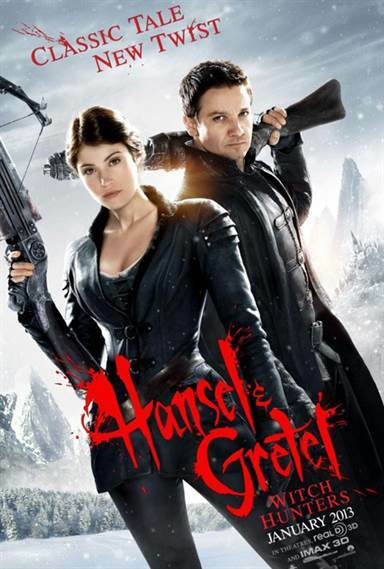 Download Hansel & Gretel: Witch Hunters from the iTunes Store in Digial HD. For more information about Hansel & Gretel: Witch Hunters visit the FlickDirect Movie Database.